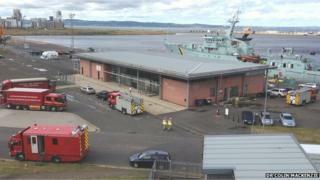 A man has been taken to hospital after breathing in "dangerous" fumes during a leak on a boat in Leith. The man was on board the Hirta fisheries inspection vessel at Ocean Drive when there was a leak from the vessel's engine. Initial indications suggested chlorine gas was involved but the fire service is using detecting monitoring equipment to identify the fumes. The incident happened just after 15:00 near the cruise liner entrance. Police Scotland said although the man was suffering from respiratory problems they were not understood to be life-threatening. The staff have been evacuated from the vessel and the area has been sealed off. Dr Colin MacKenzie, whose home overlooks the ship, told the BBC Scotland news website: "The incident came to my attention by the number of fire engines at the scene. "Then I saw two people enter the ship wearing bio-hazard suits and there are a lot of ambulances. "I know a lot of locals have been concerned about the ships being moored so close to their homes because of the hazards that can be on them and the noise from them."